nevard_110224_matfrd_sdjr7f_DSC_1561_web, originally uploaded by nevardmedia. Last week I was down in the Devon and Cornwall photographing layouts for the UK's most innovative model railway magazine Model Rail (it also has the best repro by far too). 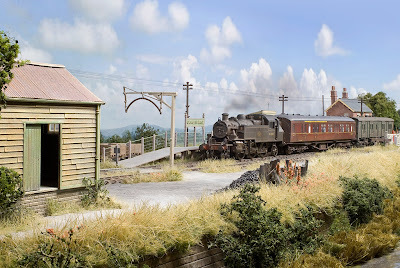 The shot here is of my freshly weathered up Bachmann SDJR 7F 2-8-0 posed on John Farmer's delightful depiction of a modern day railway outpost near Exeter in P4. Before getting down to taking the 'proper' photos, we thought it a bit of fun to back date the layout 50 or so years and pose this OO gauge loco in it. 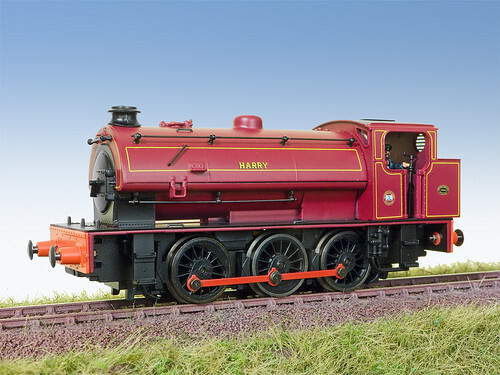 Serious toy chuff chuff fans know that OO which is 16.5mm gauge will not work on P4 which is something around 18.8333333333333333333 mm in gauge. However if one is sneaky, all one needs to do is to place a length of rail on its side just inside the rail furthest away for the far loco wheel flanges to rest on (if you look under the front of the loco just to the right of the pony truck you can just seen the rail). The 2 wagons in tow are proper P4 gauge however. It would be unfair to take credit for such tomfoolery, Messrs A York and P Marshall-Potter have done this many times in the past, but they have kept the 'how' bit a secret. 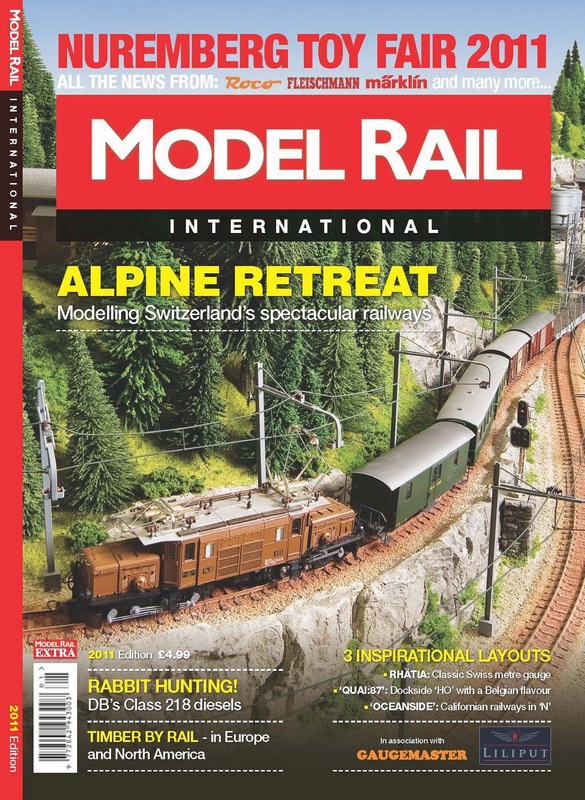 From the same team (which includes me as snapper) that brings you Model Rail Magazine, the eagerly awaited 2011 Model Rail International has just hit the shelves of newsagents and model shops across the UK. A4. Perfect bound. 130 pages. High quality paper and repro. Price 4.99. 'Austerity' need not mean dull! nevard_110225_harry_IMG_9284_web, originally uploaded by nevardmedia. Yesterday this colourful happy chappy called Harry arrived second hand from Paul Steedman of RHB Rhatia fame (see his layout the latest Model Rail International just out - get it from Smiths - that's the cover on the right by the way). As you can see, the loco is in very nice condition too in its rather smart red, which is anything but 'austerity'. This Hornby model is a little dated, so it could do with a little work to bring it up to current expectations. Some will of course replace nearly everything with bits of brass, I have no issue with that, but life I'm afraid is too short for me with so much else going on, and anyway in my case it's all about effect rather than total accuracy. So, for this reason my detail tweaks will simply involve some new lamp irons, cab handrails, smokebox handles and a finer replacement for that rather chunky grab thingamabob hanging off the saddle tank near the front. Most of these bits will be manually filed up from surplus brass 'sprue' and paper-clips. I quite like the crimson colour and fine lining, so that will stay and be subdued with bit of weathering. A new name will be chosen and take the form of an etched plate. I quite like the name 'Mendip', this I imagine is unlikely to exist 'ready-to-stick', so the actual name will probably be something else that looks and sounds suitable (suggestions if you like-please). The chassis is a little crude looking by today's standards, but once it's under a layer of grime, it will hopefully look much better, and anyway, it's a sweet running chassis after widening the back to backs to get through my C+L - so *why meddle? This loco's home will be split between Brewhouse Quay, Mendip Colliery and Cement Quay (when in olde-worlde steam mode). *Cue hate mail from the adenoidal brigade who will insist that this loco is totally wrong and that I should be building a kit from brass and how I should be publicly strung up at the next finescale meet and be whipped to near an inch of death with Peco code 100.
nevard_110222_catcott-collett_DSC_1470_web, originally uploaded by nevardmedia. Swindon's finest 3206 pauses at Catcott Burtle with the 2.20pm service from Highbridge to Evercreech Junction during the rear end of the summer of 1965. Note the brisk westerly wind catching the exhaust (which I admit to being Photoshoppery). Firstly you must gawp at the wonderful cover taken especially for this issue. 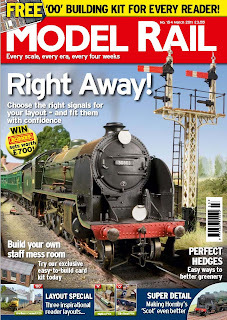 With such a crowded news stand in the uber-nerd section of the nation's favourite newsagent, it's really important to stand out from the rabble, and to carry this off in wonderful style Model Rail's George Dent has done a cracking job titivating up a Hornby King Arthur Class locomotive. 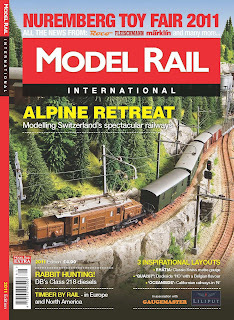 Behind the cover is the below, all propped with the best colour and image reproduction of any UK model railway magazine! Westbury Cement - showcasing Steve Jones' beautifully modelled portrayal of the well known but recently closed cement works in Wiltshire. 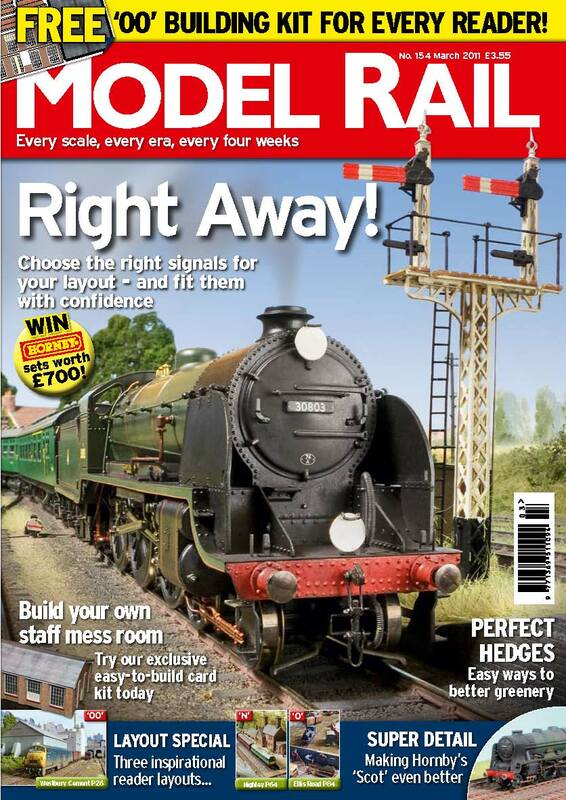 Choose the Right Semaphore Signals for your Layout by George Dent. 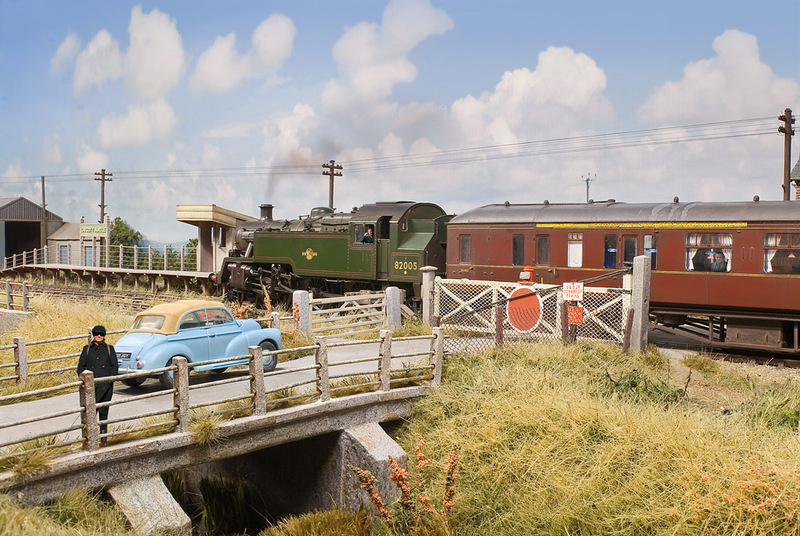 Highley Unlikeley - a delightful N gauge layout based on the Severn Valley Railway. 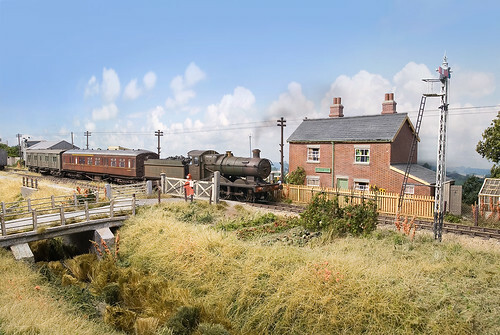 Ellis Road O layout - Rob Ellis' popular exhibition layout portraying an urban Southern Region freight backwater in the day of steam. 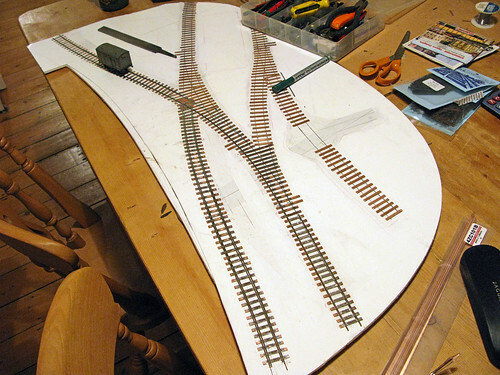 Gullant N gauge layout building - Part 3 of this micro Peter Marriott. nevard_110213_brewhouseQ_IMG_9207_web, originally uploaded by nevardmedia. Most of Sunday was spent cracking on with the trackwork on Brewhouse Quay. Once you get going this form of track contruction can be remarkably speedy. The most tricky bit of track is now complete apart from the hidden staging yard bits, the siding in the distance, and gapping sleepers and rails so it actually works. Most of the area in the foreground will be cobbled, it forming part of the canal wharf - hence all the additional check rails. nevard_110211_brewhouseQ_IMG_9181_web, originally uploaded by nevardmedia. 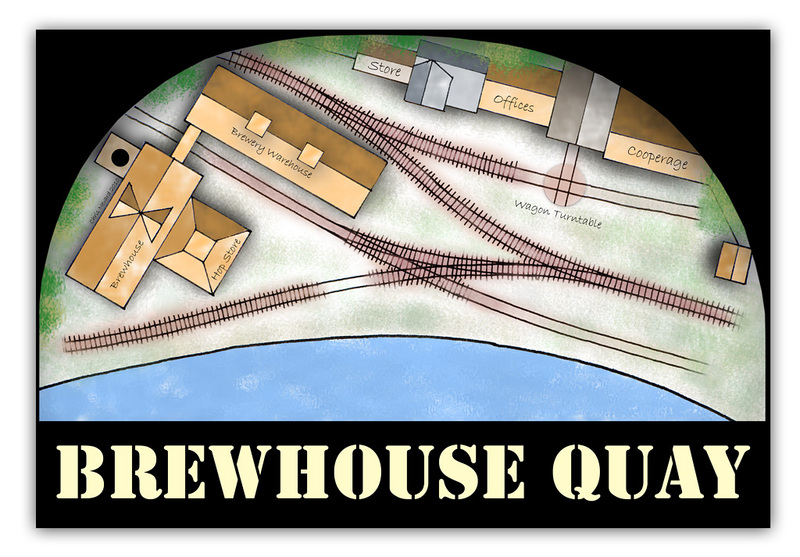 Brewhouse Quay's 'K Point' is slowly coming together - lots more in the way of checkrails/rails to add! It's actually proving easier to work in copper clad than I recall last time. Copper Clad is very forgiving if a realignment is needed - rivet in ply sleepers would be less so. I'm using code 55 flat-bottomed rail from C + L, not the N gauge version which would have a top that is too narrow, but the 4mm version which is often used to depict third-rail on Southern Region systems. My reason is for that light-railway industrial look. 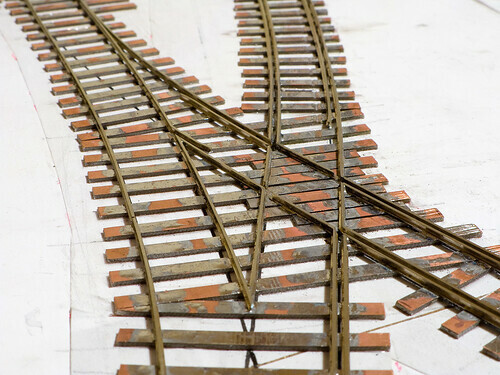 Most of the track to the right will be embedded in cobbles, hence the continuous check-rail. I will be extending the check rail on the right up to the diamond - due to a chance of plan which involves the crossing diamond area being cobbled too. nevard_110206_catcott_DSC_1324_web, originally uploaded by nevardmedia. BR Std Class 3 MT No. 82005 slows for Catcott Burtle with an early evening service from Evercreech Junction during the late summer of 1964. The layout lights were turned off and the natural north facing window light was allowed to stray in. Clunk. The only addition is the fake engine-clag and some pillock called Chris leaning out of the engine. The Morris traveller has been sprayed with a little matt varnish to kill the toy like shine. Oh yes, before I go - here's a 1280 x 800 pixel version.. I frequently get requests from toy chuff chuff fans wanting to be my 'friend', however I'm a shy retiring type who only keeps a personal Facebook account for family and the closest of friends - that aspect I'm sure most will understand unless they're a railway modelling stalker. I don't really want to show the obilgatory out of focus drunken shots to the rest of the world because they're really not pretty much of the time. And anyway, most people I'm sure really just want to snigger at my railway modelling, photography and occasional humourous swipes at the 'odd-brigade' who give us all something to cackle or roll our eyes at when at exhibitions. So, in response to the above, I have set up a 'Facebook Page' to announce new photos, website and blog updates, an exhibition diary, answer a few questions on how not to 'do' model railways and photograph the resulting distasters in a slightly more casual interactive way than my Twitter account allows. CLICK HERE, to get to the Facebook page. The non-fluffy small text: unlike a personal Facebook account, there is no restriction or approval required. Iffy members trying to sell stuff to increase the size of ones member will be removed howver. Digital Photography with 1960's Tech. Click on the photo above for a 1024 sized version. 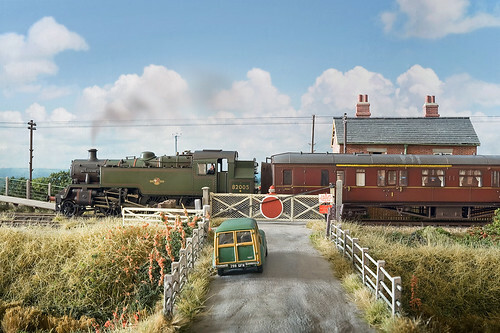 This snap shows a typical Highbridge Branch train as seen in the last 2 years of the line's existence; a single Hawksworth Brake Compo and a ex-Southern Railway bogie-van for perishables (fun things like cider and cheese). You can see some rather nice prototype photos of such trains here. Note the narrow gauge trucks in the background used for transporting peat from the nearby moor. I hope to get that aspect operational before the next show. Of more interest to photographers, might be that this photo was taken using a Nikon Nikkor 35mm focal length prime lens dating from the mid-1960's. We tend to think of digital photography as throwaway, but this need not be the case, many makes of digital SLR allow the use of wonderful older lenses - and 'vintage' is so cool! So, if you have a limited budget, the smart money will always go on a good lens, the chances are that you or your kids might still be using it 45 years later like here - whereas that expensive camera body will be down the car boot sale with all the knocked off tat in just 5. And the real bonus is that 'camera make' prime lenses are frequently optically far better than mid-priced zooms and go for pennies on Ebay! Of course that smarmy salesman in the out-of-town megastore will not tell you any of the above for obvious reasons. So, here we have a portrayal of the end of steam scenario, taken on a lens that was around when steam ruled supreme, well just! 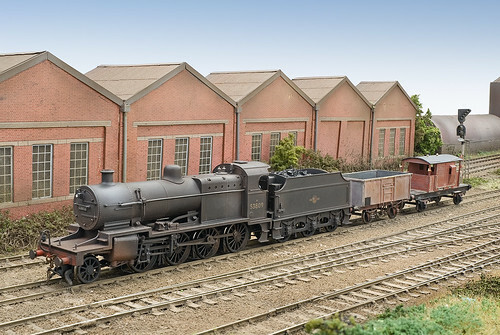 Loco: Bachmann Ivatt Class 2MT 2-6-2 renumbered, detailed and weathered. Van: Ratio (Kit) SR bogie van. Toys: Nikon D200, Nikkor S 35mm f2.8 shooting RAW with the camera firmly mounted on a tripod. Exp: 3 sec at f16, using 6 exposures combined in Helicon Focus to extend the depth of field. Lighting: The layout's own fluorescent lighting. Cheating: The only computer addition is the loco-clag using 'Clouds' in Photoshop. Not-cheating: The sky is physically there, is actually part of the layout and was produced photographically - proof here for those that think everything is make-believe these days: http://www.nevardmedia5.fotopic.net/p57399245.html . I'm mid-way through writing an article for the popular press on doing such. Look, I Shrunk the Wife! Ok, now I've got your attention with my wife superimposed in unseasonal clothing onto the little bridge that crosses the remains of the Glastonbury Canal next to Catcott Crossing, the real reason for this post is to highlight a little basic weathering on the rather splendid new Hornby ex GWR Hawksworth Brake Compo. These rather stylish coaches were regularly used during the final couple of years of the former SDJR Highbridge Branch. And yes that is me in the cab looking stupid. Weathering has involved a few washes of black acrylic mixed with Carr's rusty coloured weathering powders, the filthy mix was then splashed all over the pristine coach, wiped off and then buffed with a stiff decorator's brush to produce a nice sheen whilst working the pigment into the recesses. Prior to this filthy task, the roof was repainted a darker Humbrol matt grey. 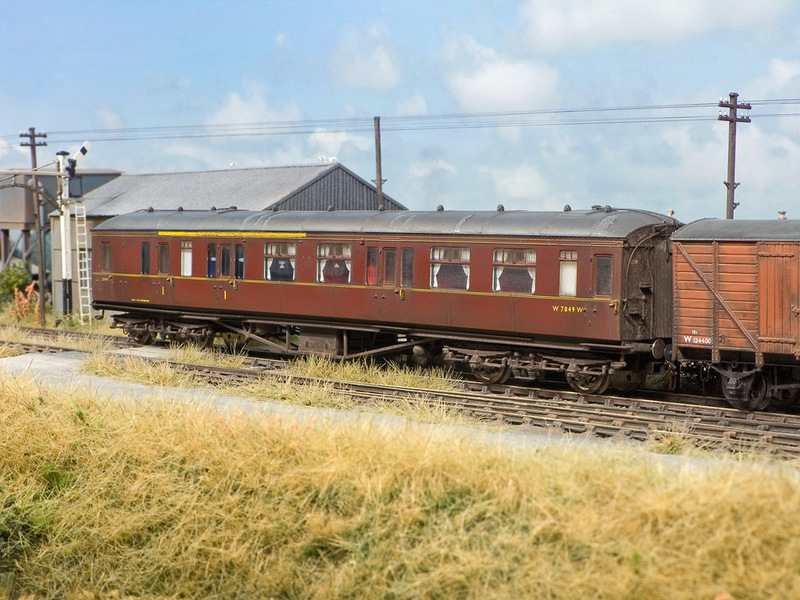 The peeling paint which appears to be a feature of these coaches in their final years was achieved by applying some PVA glue before-hand and then peeling it off after the darker grey paint was applied to reveal the original lighter colour underneath. Of course there are special bespoke products to do this - but you know me by now I'm sure. Tight. I also added a 'first class' stripe just below the roof line courtesy of some HHRS Pressfix, the model doesn't come with this, but photos of these coaches show such in 1964-65. Below, a slightly more close up view which hopefully better highlights what I have done. Further improvements might be to remove the glazing and paint the edges of the clear plastic to reduce or possibly eliminate the slight prism effect. Of course some passengers could be added too (the token passenger on the right in the top photo is a well known model railway scenic expert courtesy of Photoshop) - but we all know that this little piece of railway never carried anyone in its final years apart from spotters so who cares? Before some spod with an irritating adenoidal voice takes great delight in letting me know that the guard's handrail is missing - yup I know, it got damaged when buffing the coachwork - so it will need to be replaced with some brass wire. I quite enjoy these quickie weathering jobs, they really transform these already excellent ready to run models. So, next I quite fancy doing a Hornby 'Blood & Custard' Maunsell 3 coach set next using similar techniques for running on Combwich, such will look super behind an ex Midland 4F. nevard_110204_brewhouseQ_IMG_9143_web, originally uploaded by nevardmedia. Here's a looking down Google Earth kind of view showing the whole caboodle. The whole layout is importantly contained in 4ft x 2ft3 area, the area to the left and behind the backscene being hidden staging/fiddle areas that are accessed by a sector plate which also completes the run around loop which should produce a good shunting puzzle. The foamboard sub base is just resting very roughly in position to show how it will work one bonded firmly in position. Disclaimer for armchair modellers: this layout is not finished, the buildings are only positioned approximately, the little row of buildings at the top are just there for effect, I might or might not be using them, and if I do they'll be hacked about accordingly. The backscene will not be left bare wood and will not have one pasted on from Peco, it will be painted or produced photographically as with Catcott. The whole diorama 'box' will have it's own built in lighting rig. This layout will form part of the Model Rail Mag road show from time to time to display new releases, some of which may never have gone near a brewery in real life. And no, I won't be building another one in N gauge. It's my layout - so there. nevard_110204_brewhouseQ_IMG_9104_web, originally uploaded by nevardmedia. Track laying has now started in earnest on my brewery project. Because the layout will be presented diorama style with a high curved backscene on 3 sides as mentioned on previous posts, I'm laying the track 'off set' using a 5mm foamboard sub-base which will be firmly bonded to the proper plywood base once most of the fiddly stuff has been done. It's much easier to work this way because I can spin the base around to suit and really ensure that the trackwork is all properly aligned without having to resort to some kind of contortion act. Good track is something that is particularly important with a layout which will mainly be running 4 wheeled locos, though of course one should always aim for well laid track irrespective of what one is running. Much of the trackwork on the left hand side (which is next to the canal basin) will be embedded in sets (cobbles), so armchair modellers should worry too much about the iffy sleeper spacing. Note the check rails on the nearest line in preparation for the 'sets' which will probably be scribed Humbrol Air Clay.